There is my tassel. It is tied to my computer bag and whenever I see it, it has sort of a calming influence on me. It reminds me that He is my God and I am His child. That means I do not have to be distracted by my feelings or the things of this world that get me off track. I made this tassel myself and you can make one too. Follow my suggestions for construction, but choose your own colors and make it any size you like. 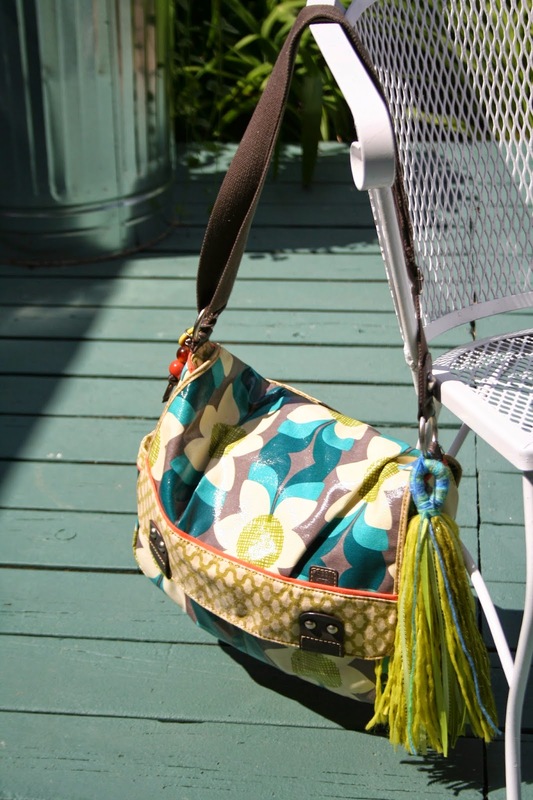 Cut several lengths of yarn, fibers, or ribbons. 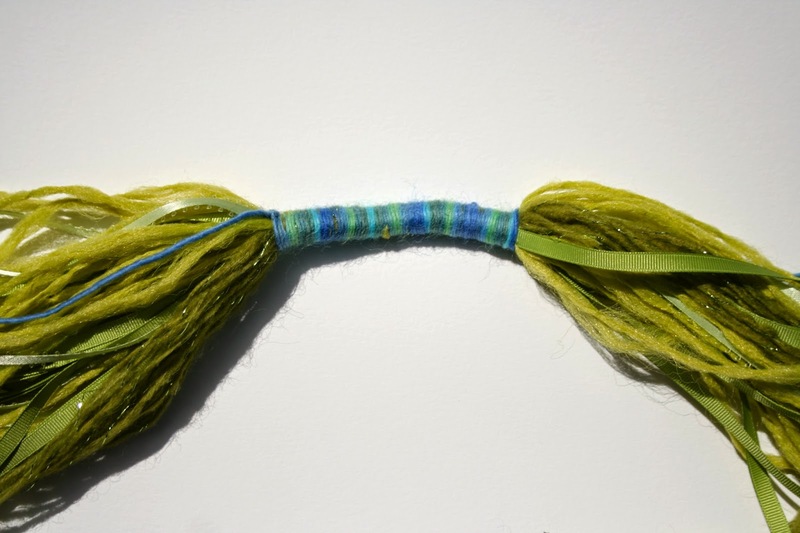 For my tassel, I cut about 60 pieces in the lime/chartreuse family, each about 26″ long. 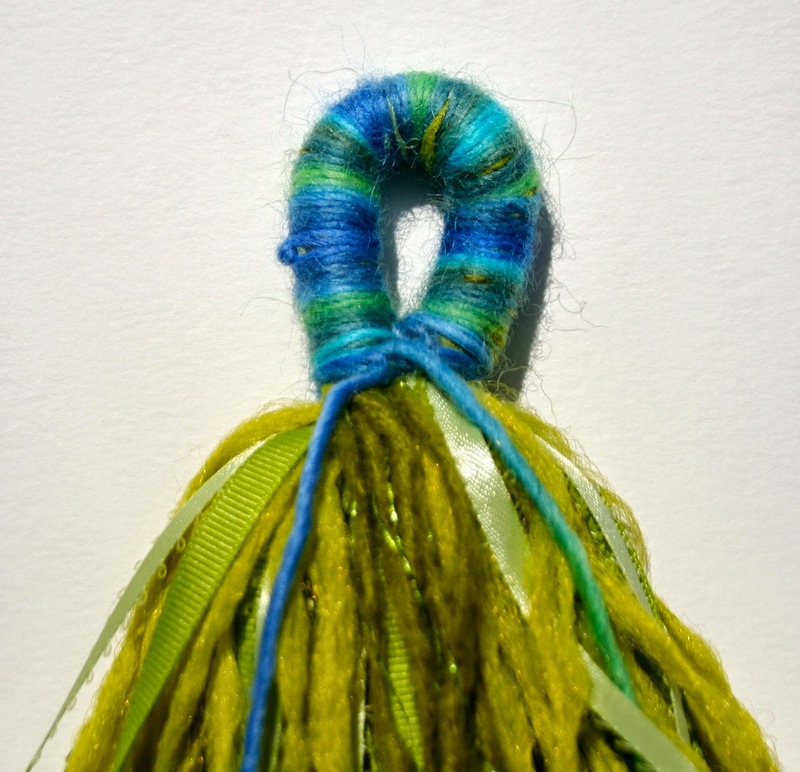 Using a 4 yard piece of blue (per God’s instruction) ombre yarn, I wrapped about 5″ right in the center of my green lengths. Wrap as tightly as you can. Start this by knotting one end of the blue yarn at the starting place. 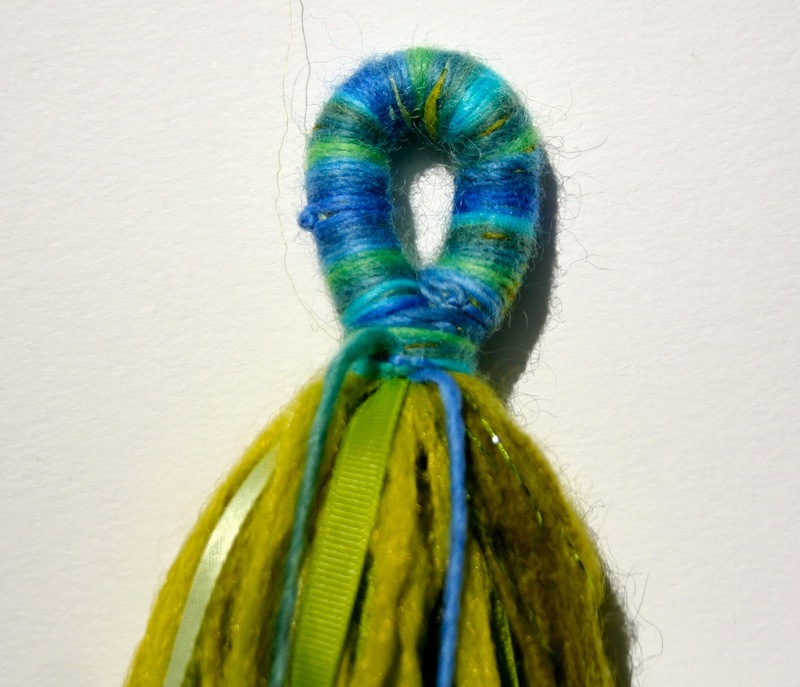 Finish by knotting the blue yarn to a piece of green yarn. 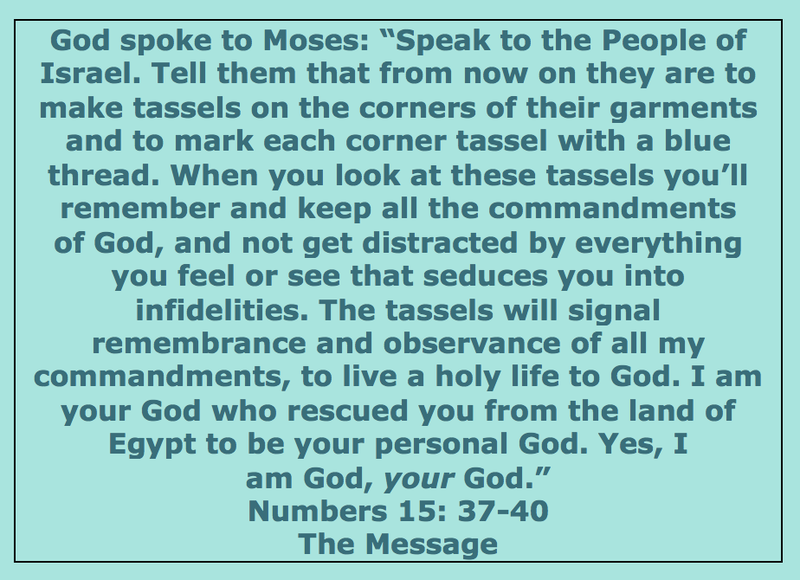 A yarn/ribbon tassel is a loose translation of this passage. 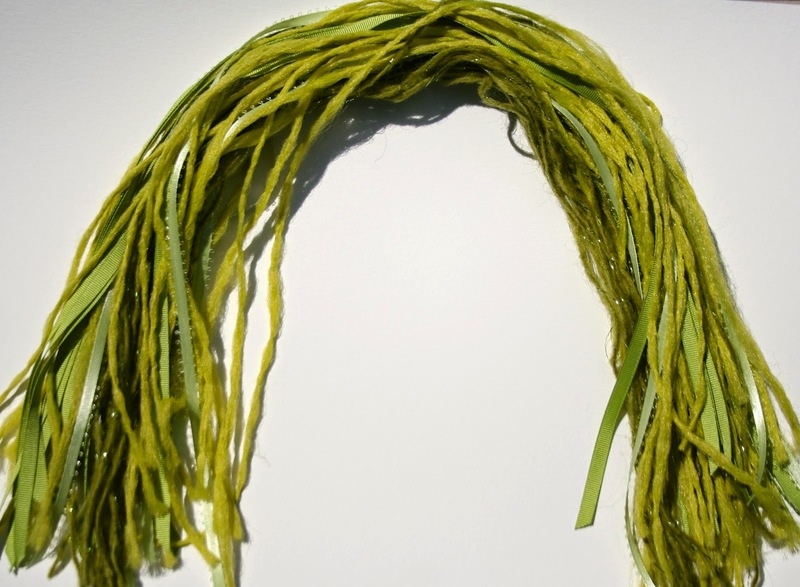 By tassel, the translation really means fringe. And the word blue in this passage is translated from the Hebrew word tekeleth, which means violet. The Old Testament Jews were commanded to add fringe to the hems of their garments. It was not for the cool factor, it was to remind them when they looked down at their fringe or felt it as they walked, of God’s commandments. In Old Testament times, fringe was actually uncool, and it set the Jews apart from everyone else. Pull the two blue strands together, forming a loop. Pull tight and knot them together. Wrap the longest blue yarn end tightly under the bottom of the loop. Wrap 8 or 10 times tightly, and knot the blue yarn ends together. 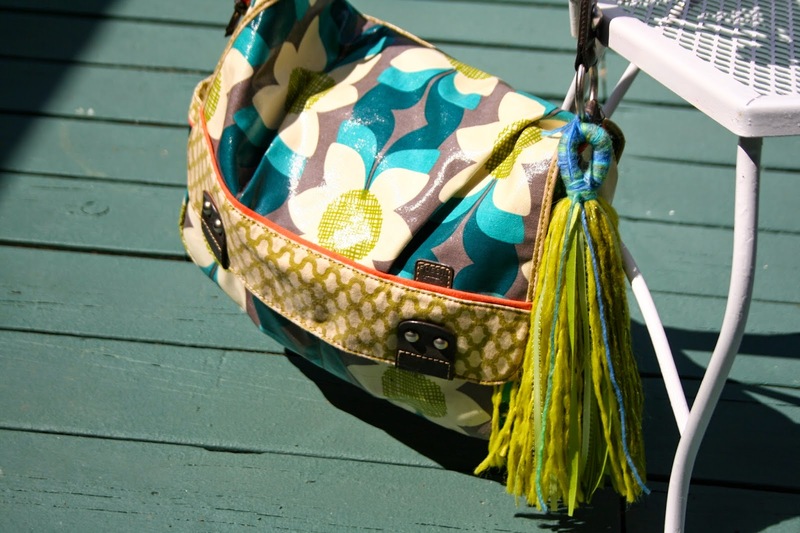 If your tassel ends are raggedy and that bothers you, give your tassel a trim. Tie it to your bag, your chair, pin it to your bulletin board, put it wherever you will see it so you will remember and not get distracted.